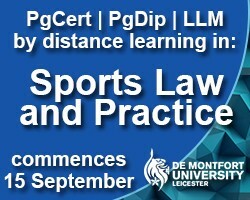 Leicester De Montfort Law School Master of Laws (LLM) in LLM in Sports Law and Practice by Distance Learning, customise your own course commences 14 September 2018. Don’t let your location deprive you of the chance to gain an LLM in Sports Law and Practice. This distance learning course from De Montfort University brings quality learning and training to anyone from anywhere with an internet connection - effective study without interrupting your life. This distance learning programme from De Montfort University brings quality learning and training and will give you the opportunity to improve your career prospects without compromising your work commitments, and is designed with employability in mind. Keenly interested in pursuing this convenient study route...wow! For Africa.